The 28th of May was the day I decided to finally join an official race again after my challenging Winter Run in February 2015. 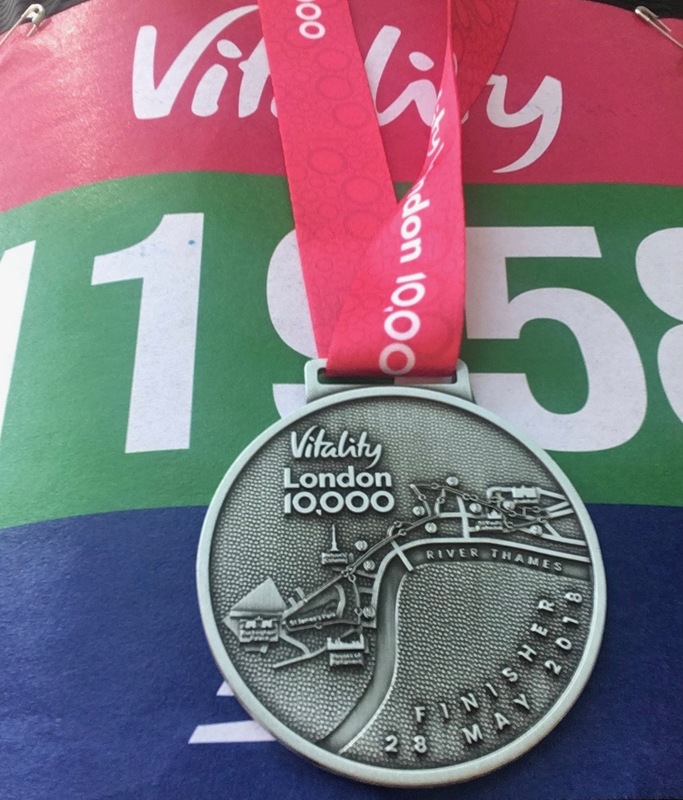 I was basically inspired when I joined hundreds of runners in London to #FinishForMatt in April. That experience was strangely uplifting because I found myself amidst passionate runners who came together that day to pay tribute to a man most of us never knew. 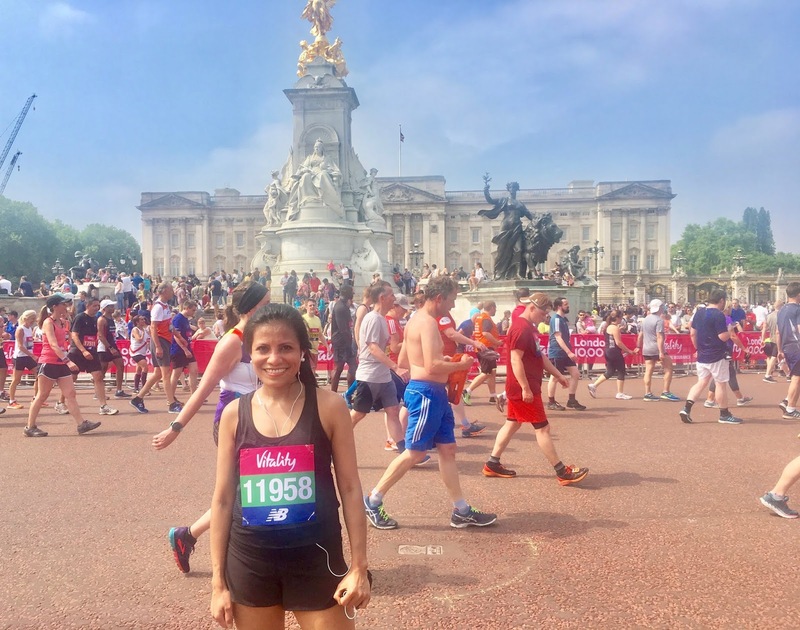 It was then I realised that I could actually join a race on my own and that it will be okay. 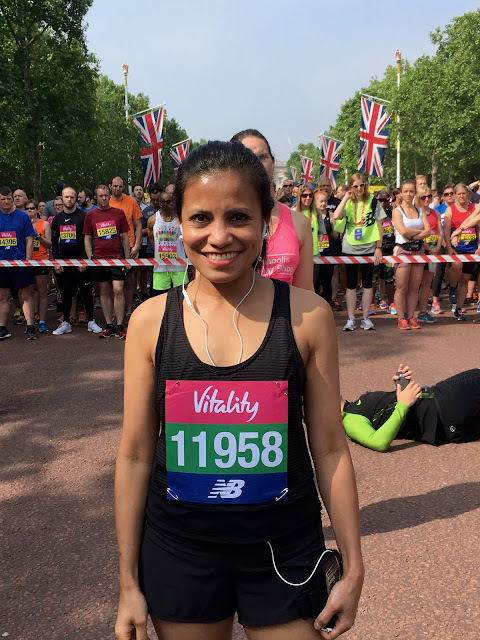 So without any second thoughts, I registered for the Vitality 10,000 a few days later. 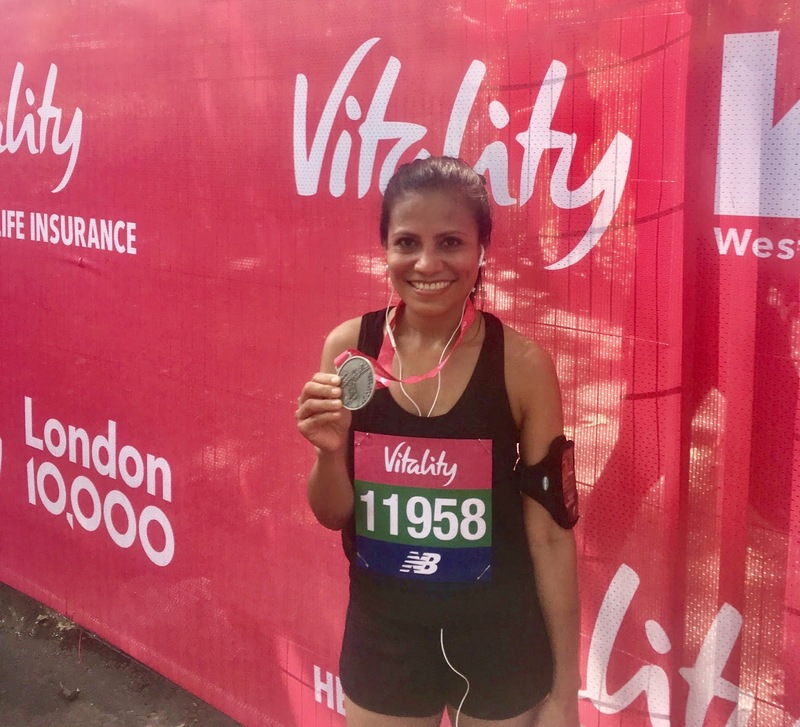 I chose the Vitality 10,000 to be my first official race in 2018 because I am a Vitality member and the event was where I normally run so it was convenient for me. I left our flat 30 minutes before the start time thinking that it was only about 10 minutes walk, only to be told that my normal route was closed and that I had to walk all the way to Green Park via Piccadilly Road. With a hint of panic, I ran to the venue so I could make it on time (although I really hate warming up before a race). I got there just as runners were making way to their respective start zones. We set off just after 1030 am. I was feeling excited as this was another thing that I've never done before (to join a race alone). I decided to listen to Keith's playlist as I have not listened to it in a while. I started strong I thought, but I felt a bit weird just after 1km. I was breathing heavily and felt that I was pushing myself too hard, and I just started. I know it is now a cliche for you, but Lighters came on and I was reminded of the boy who inspired me to run in the first place. So, I took one deep breath and reminded myself that I could do it. I felt better after a few minutes of much needed self-reassurance. Then I saw a kid reaching out for a high-five so I gave him one. And then the bands came on and that was it. I was definitely back on track. I did few more high fives with children throughout the race, and some of the bands almost got me into dancing because of their lively music. There were loads of people cheering- one thing that I love about London races. 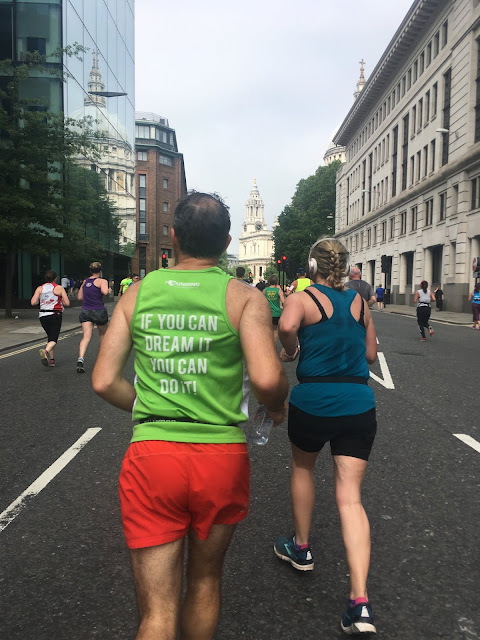 The London crowd is the best for me, although I've only done four other races outside London( Paris to Versailles, The Hague, Cardiff and Bristol). 5km seemed too far that day for some reason, but I was running at a steady pace. I later found out that I reached km 5 just under 30 minutes, so it was good. I felt even more energised when I heard some classical music from the West End Musical Choir. It was beautiful. Some parts of the City were quiet though. Luckily, I could hear some music from a distance, so that kept me entertained whilst I tried to convince myself to run a bit faster so I could finish in under an hour. Once I hit the 7km mark and heard loud cheers, I was more motivated to reach for my goal. And with Beyonce's "Crazy In Love" in the background, I was really up for it. I was distracted for a while, so when I realised I have reached Trafalgar Square, I knew I was nearly home. With only so little energy left because of the hot weather, I smiled at every spectator who cheered me on and said thank you to them. The last 500m has always been the toughest for me mentally. It's just basically the thought of getting too close to the finish line, and yet it feels so far. 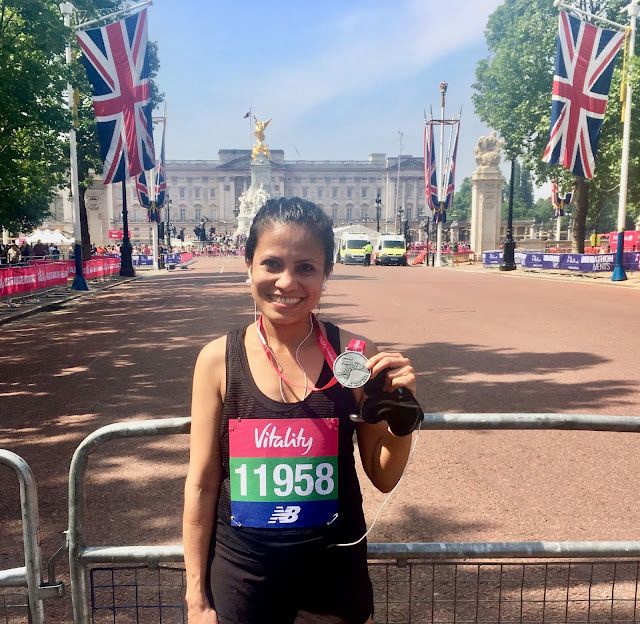 But as always, the cheers became louder as I approached the finish line, which gave me the last push to hopefully finish on time. And I did. I finished in 59 minutes 6 seconds! I was happy to receive a new medal because somehow I have lost my previous medals. It's a shame really because I worked hard for those medals but never mind. It is never too late to start over again. I was also happy to get a glimpse of Sir Mo Farah during the event. I am glad he won the race. Also, I learned a few things during the event which inspired me to do more races, and do more in life as a whole.